Not long ago a newspaper reporter came to interview me on the subject of unusual foods, and I described to him the persimmon-leaf sushi made by the people who live deep in the mountains of Yoshino—and which I shall take the opportunity to introduce to you here. To every ten parts of rice one part of sake is added just when the water comes to a boil. When the rice is done it should be cooled thoroughly, after which salt is applied to the hands and the rice molded into bite-size pieces. At this stage the hands must be absolutely free of moisture, the secret being that only salt should touch the rice. Thin slices of lightly salted salmon are placed on the rice, and each piece is wrapped in a persimmon leaf, the surface of the leaf facing inward. […] A slight bit of vinegar is sprinkled over each piece with a sprig of bitter nettle just before eating. I first read Tanizaki’s In Praise of Shadows in 1990, when I was stationed in Japan during my short and very sweet four years in the Navy. I had long adored Japan from afar and couldn’t believe my luck at being sent there to live and work directly out of college. Tanizaki’s book with its mournful and highly aesthetic sensibility seemed incredibly strange and yet completely familiar to me—something I could say of Japan in general. The more I learned about Japan, with all its paradoxes, the stronger I felt a sympathetic resonance in my heart. Although I was usually empirical in my thinking, I would visit some old farmhouse in the mountains and become convinced that I was once Japanese. This bizarre love affair has never really ended for me. My husband and I met and fell in love in Japan, and so Japan will always be the place where love begins. After many years of travel with the Navy, we were able to return to Japan from 2005 to 2008, three fortunate years during which I studied Japanese, drank excellent sake, and communed with friends. This blog started during that time. The posts from the first year reflect the happy life we had there (despite his many Navy deployments). We returned to the States about a year ago, and I allowed our busy American life to absorb me (buying a house, finding a job, working, trying to catch up with pleasure on a Saturday). I thought of (think of) my Japanese teacher every day, feeling sick at heart at my neglect of her (I must write in Japanese, so I rarely do it), feeling saddened to witness the Japanese words I so carefully tended in my mind to wither and die. Something had to be done. I signed up for Japanese classes at the Japan-America Society of Washington, D.C. At work, I started taking short breaks with my kanji dictionary, enjoying their mystery again. I came home one day, unboxed my 土鍋 (donabe, earthenware pot) and cooked Japanese rice from Niigata. I remembered a recipe for making rice that I had carefully translated from Today’s Cooking きようの料理 magazine for one of my Japanese classes with my incredibly patient sensei. The recipe had very specific instructions for washing rice, giving the “five fingers apart shooshing” and the “swirly fingertips” methods of moving the rice around in the rinsing water. My teacher made the motions with her hands, giggling. She said, “I never cook. This seems incredibly fussy to me.” We laughed and drank green tea. Tanizaki’s essay came to mind as I reflected on missing Japan. What did I miss? What could I capture here in the D.C. area? Tanizaki was mourning what he thought was the end of pure Japanese aesthetics with the arrival of modern, Western life (e.g., the harsh glare of electric light). I was not mourning an ideal past of Japan, but specific pleasures like sake tastings with friends, the local fishmonger, my teacher’s ironic laughter, even the sweat that dribbled down my back at I stood waiting in August for a train to Tokyo. I missed Japan. I miss Japan. I can have shadows of it here, a sip of sake, a moment or two with Kenkō’s Tsurezuregusa (Essays in Idleness), and perhaps a letter to my teacher written vertically on the stationery she gave me. So, I made some omusubi (rice balls) stuffed with the flesh of pickled plums. I wet my hands and rubbed a bit of salt on them and formed the triangles around the dark pink bainiku. 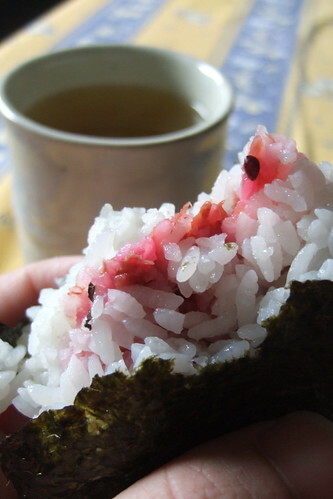 In the morning, I toasted nori to wrap around the rice. It tasted just right to me. Japan must be summoned in a rice ball. i discovered your blog through Tokyofoodcast. What initially caught my eye and interest was the Ambrose Bierce reference on your site. But as it turned out it was just a very well written essay on your life in Japan and the States. Thanks for sharing.